Tormek have released the latest version of their successful slow running water-cooled grindstone, now with a seven-year guarantee. 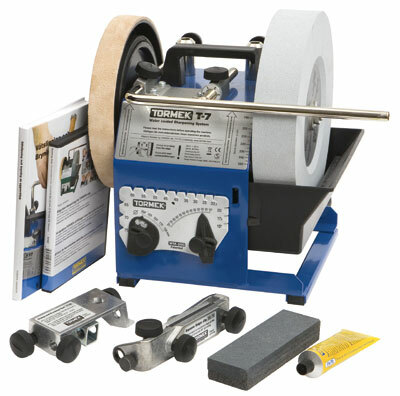 I have had a Tormek for several years now and rely on it for re-grinding damaged tools that students bring to me. The first thing which I noticed was that the universal support bar now comes with one arm threaded and a fine-tuning nut is fitted. This nut is indexed which helps in making adjustments. Gone are the days of having to mark the bar with a felt tip pen! The horizontal base has also been improved to give a tighter fit to the bar. Grindstone faces have to be true both to the axis and to the jig being used. Tormek's previous method of truing and dressing in the past was hard to keep accurate, however, they have addressed this now with the introduction of the TT-50. This is a jig, which fits firmly to the universal support bar and has a threaded rod passing through the diamond carrier holder. Turning the threaded rod causes the carrier to traverse the face of the grindstone. The speed at which the rod is turned controls the fineness of the dressing. The T7 can be used with the multitude of Tormek jigs which cover carving, turning, cabinet making, gardening and domestic-edged tools. In the T-7 box there is a square edge jig, a truing and dressing tool, an angle setter, honing compound, a stone grader, a DVD and most importantly, a detailed handbook which contains lots of useful information. The square edge jig for straight and tapered chisels and plane irons has been improved. It now has a three point clamping system that allows chisels with tapered bodies to be held firmly. This is particularly relevant for Japanese chisels. It also has two stops which can be attached to the new universal support to prevent the tool from overshooting the edge of the stone. Carvers will need to purchase separately a SVS-32 short tool jig for sharpening their tools. Other improvements are the use of stainless steel for the arbour and other metal fittings which will reduce wear and prevent rust. The dressing tool, the universal support and the square edge jig are all available separately but the seven-year warranty makes it worth investing in a whole new unit with all the jigs. I've used practically every incarnation of the Tormek system and the improvements incorporated in the T7 make this version the best yet. For beginners or experienced users who want to save steel by accurate repeat grinding, this is a most worthwhile investment which I recommend. "The improvements incorporated in the T7 make this version the best yet"